Striking in its simplicity, Dempsey Essick’s rendering of a simple bouquet of Rose of Sharon Blossoms, displayed in an unadorned canning jar, literally glows in the first light of a summer morning. The simple diagonal composition which places the subject flowers between a realistically portrayed post and rail in the lower left and a light patch of early morning sky in the upper right of the frame, directs the viewer’s eye to the center and the masterfully executed subject. That the flowers in “Rose of Sharon” are so realistic comes as no surprise since Dempsey Essick is well known for his paintings of flowers. 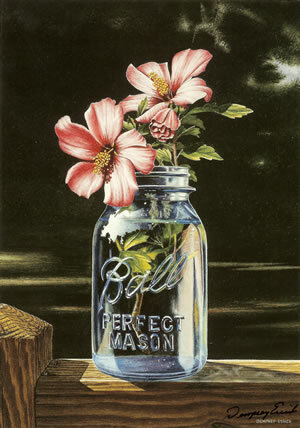 It is the container, the Mason jar, that immediately captures the eye of the viewer. Clear glass is the supreme test of an artist’s skill and Dempsey has demonstrated here that he is equal to the challenge. The clarity of the glass with all the reflections and highlights from the raised lettering and screw-top threads, to the mottled shadow of light passing through the glass and water, is astonishing to viewers who sometimes get closer to assure that, somehow, a photograph has not been inserted into the scene. “Rose of Sharon” is a benchmark painting for Dempsey, pointing the way to simpler subjects of exceptional beauty and exciting detail.